This strategy raises a number of issues related to the treatment of the atmospheric effect on the remote sensing signal, and to the time scales involved. Since those issues are also relevant for a wider range of applications where remote sensing data are assimilated within atmospheric and land surface models, they are first discussed in a more general context [cf. Verstraete and Pinty, 2000]. rences between temporal and spatial scales at which atmospheric and surface properties change: while surface properties are very variable in space but only change on a weekly to monthly time scale, atmospheric variables tend to be spatially coherent over hundreds of kilometers but can change within hours. This discrepancy in scales creates scaling problems, but has made weather forecasting possible without taking surface properties into account. In numerical weather prediction, the impact of surface properties is essentially treated as a perturbation that introduce some degree of uncertainty into the derivation of atmospheric parameters from the satellite data [Le Dimet and Talagrand, 1986], In fact, TOA radiances are not normally assimilated directly; instead, certain atmospheric parameters are derived from the satellite data and then assimilated. For example, the 3-D variational analysis scheme implemented in February 1996 by the European Centre for Medium Range Weather Forecast [ECMWF, Anderson et al., 1994] uses, among other data, thermal infrared and microwave soundings from NOAA's TIROS Operational Vertical Sounder [TOVS, Smith et al., 1979] to assimilate wind, temperature and humididty. The opposite applies to the assimilation scheme presented in this study: the focus is on the monthly response of vegetation and the surface energy and water balance to climatic forcing, independent of short-term fluctuations of the atmospheric state. During the derivation of fAPAR, those atmospheric fluctuations are partly removed by cloud screening algorithm and monthly averaging, while the impact of the average atmospheric state on the satellite signal is removed by atmospheric correction. The impact of the remaining uncertainties about the state of the atmosphere is minimised by choosing a vegetation index relatively robust against those fluctuations, and are accoun-. ted for by assigning an uncertainty for the derived value of fAPAR (see below). For longer simulations than medium-range weather forecasts, however, both surface and atmospheric variables matter [Verstraete, 1989]. A suitable strategy for this kind of situation is outlined by Fig. 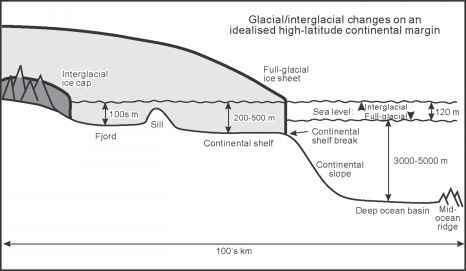 1: atmospheric variables are assimilated into a coupled atmosphere-land surface model at a short time step - daily or shorter - while holding surface variables constant. At longer intervals, e.g. 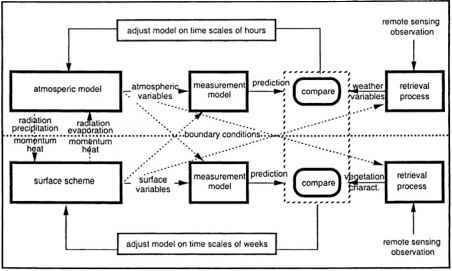 weekly or monthly, surface variables are then assimilated, using the atmospheric state predicted by the model to account for the atmospheric effect on the TOA radiances measured by the satellite. The modelling framework presented here represents a first step in this direction. Assimilation of fAPAR is carried out "off-line" because it is com-puationally less expensive than assimilation within a GCM, and because coupled vegetation-atmosphere GCMs are still a very new development that have not yet been tested extensively. Another reason is that the spatial resolution of 1 ° is closer to the 15 km resolution of the satellite data than the resolution of most GCMs, so that the potential of satellite-derived fAPAR for assimilation into surface schemes can be explored in more detail. As far as time scales are concerned, monthly averages of fAPAR derived from satellite data are compared to monthly averages computed by the BETHY scheme. The assumptions are that both represent mean climatological conditions, and that, to a first approximation, differences between the simulated and satellite-derived fAPAR arise solely from parameterisations of the BETHY scheme, and not from deficiencies of the climatic input data, or a mismatch of the periods covered by satellite and climate data.